Patent advisors are often asked this question. In Canada, CIPO has published the first-ever IP Canada Report, which contains an interesting trove of IP statistics. Among the infographics and pie-charts is a series of bar graphs showing the time to issuance for Canada patents. Over the past four years, the patent office in Canada has been able to shave months off the delivery time, but the average is still in the neighbourhood of 80 months, or roughly 6 1/2 years. Certainly some patents will issue sooner, in the 3 – 4 year range, and some will take much longer. 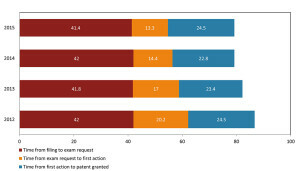 There are strategies to influence (to some degree) the pace of patent prosecution. And remember, this is the time to issuance from filing. The time to prepare and draft the application must also be factored in. Ensure that you get advice from your patent agent and budget for this period of time, it’s a commitment. More questions on patenting your inventions? Contact us. The Canadian trademarks office has released a Practice Notice in order to clarify current practice with respect to applying the descriptiveness analysis to geographical names. In our earlier post on this topic (Trademark Series: Can a Geographical Name be a Trademark? ), we noted that a geographical name can be registrable as a trademark in Canada. The issue is whether the term is “clearly descriptive or deceptively misdescriptive” in the English or French languages of the place of origin of the goods or services. In some case, the “actual origin” of products may be easy to determine – where, for example, apples are grown in British Columbia, then it stands to reason that “British Columbia” would be clearly descriptive of the place of origin and thus clearly descriptive of the goods. Apples are likely to be grown and harvested in one location. But how would one determine the “actual origin” of, say, a laptop which is designed in California, with parts from Taiwan and China, assembled in Thailand? If the examiner decides that the geographic name is the same as the actual place of origin of the products, the trademark will be considered “clearly descriptive” and unregistrable. If the geographic name is NOT the same as the actual place of origin of the goods and services, the trademark will be considered “deceptively misdescriptive” since the ordinary consumer would be misled into the belief that the products originated from the location of that geographic name. It’s worth noting that the place of origin of the products is not the same as the address of the applicant. The applicant’s head office is irrelevant for these purposes. Need assistance navigating this area? Contact experienced trademark counsel. Canada’s Anti-Spam Legislation (CASL) is overly complex and notoriously difficult to interpret – heck, even lawyers start to see double when they read the official title of the law (An Act to promote the efficiency and adaptability of the Canadian economy by regulating certain activities that discourage reliance on electronic means of carrying out commercial activities, and to amend the Canadian Radio-television and Telecommunications Commission Act, the Competition Act, the Personal Information Protection and Electronic Documents Act and the Telecommunications Act). The concept of implied consent (as opposed to express consent) is built into the law, and the trick is to interpret when, exactly, a company can rely on implied consent to send commercial electronic messages (CEMs). There are a number of different types of implied consent, including a pre-existing business or non-business relationship, and the so-called “conspicuous publication exemption”. the message is relevant to the person’s business, role, functions, or duties in a business or official capacity. In this case, Blackstone Learning sent about 380,000 emails to government employees during 9 separate ad campaigns over a 3 month period in 2014. The case against Blackstone by the CRTC did not dwell on the evidence – in fact, Blackstone admitted the essential facts. Rather, this case focused on the defense raised by Blackstone. The company pointed to the “conspicuous publication exemption” and argued that it could rely on implied consent for the CEMs since the email addresses of the government employees were all conspicuously published online. The CRTC observed that “The conspicuous publication exemption and the requirements thereof set out in paragraph 10(9)(b) of the Act set a higher standard than the simple public availability of electronic addresses.” In other words, finding an email address online is not enough. The decision does not provide a lot of context around the relevance factor, or how that should be interpreted. CRTC guidance provides some obvious examples – an email advertising how to be an administrative assistant is not relevant to a CEO. In this case, Blackstone was advertising courses related to technical writing, grammar and stress management. Arguably, these topics might be relevant to a broad range of people within the government. Note that the onus of proving consent, including all the elements of the “conspicuous publication exception”, rests with the person relying on it. The CRTC is not going to do you any favours here. Make sure you have accurate and complete records to show why this exemption is available. Essentially, the email address must “be published in such a manner that it is reasonable to infer consent to receive the type of message sent, in the circumstances.” Those fact-sepecific circumstances, of course, will ultimately be decided by the CRTC. Lastly, the company’s efforts at compliance may factor into the ultimate penalty. Initially, the CRTC assessed an administrative monetary penalty (AMP) of $640,000 against Blackstone. The decision noted that Blackstone’s correspondence with the Department of Industry showed the “potential for self-correction” even if Blackstone’s compliance efforts were “not particularly robust”. These compliance efforts, among other factors, convinced the commission to reduce the AMP to $50,000. As always, when it comes to CEMs, an ounce of CASL prevention is worth a pound of AMPs. Get advice from professionals about CASL compliance. See our CASL archive for more background.